5 diamond engagement rings do not only make amazing engagement rings, they also are amazing wedding anniversary gifts for those that are celebrating a 5 year wedding anniversary. 5 diamond engagement rings come in many different styles and you can customize your 5 year wedding anniversary gift however you choose. From metal type, setting style, and carat weight, you can make one of these 5 diamond engagement rings the anniversary present of a lifetime. Five years of marriage is a huge milestone for any relationship. Those 5 years have been spent learning how to grow together as a couple. The first five years of marriage make you even closer than before and you should want to reflect that bond with one of these exquisite rings. 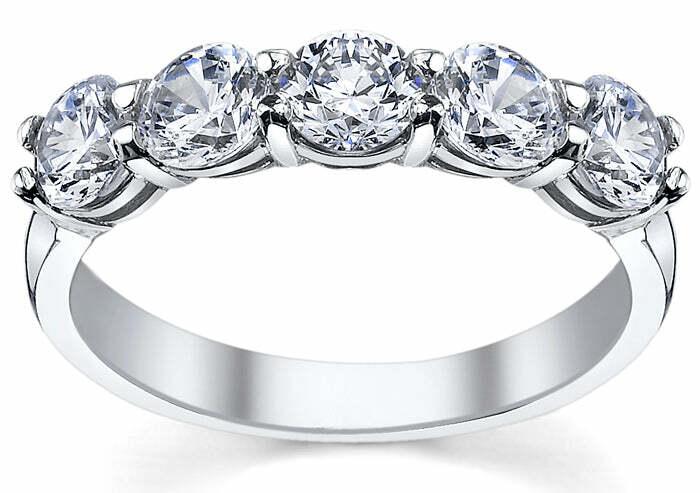 One of these five stone rings is the perfect gift for your wedding anniversary. Your 5 year wedding anniversary should be spent recounting the many happy memories that you have together as a couple. Reminisce about how the two of you met. A cute idea is to recreate your first date. Look through your wedding album and re-watch your wedding video. The most important thing to do on your 5 year wedding anniversary is to recapture the magic and spark that the two of you first felt when you first met.